With all of the toxic chemicals and fumes which are released during film processing, the need for adequate ventilation in darkroom work areas cannot be over emphasized. Improperly ventilated space can be harmful to the health of workers. Now available is our "Air-No-Lite" 100% light tight darkroom exhaust fans and louvers which insure healthy ventilation continuously. Each fan is one piece molded body and five sections molded louver. Different sizes of fresh air supply louvers are available. Each size is designed to supply just the right amount of air to a particular model exhaust fan. 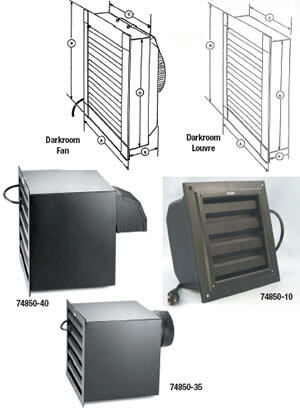 Exhaust fans work best in a darkroom that is equipped with fresh air supply louvers or some other kind of air supply. If there is no air supply to the darkroom, the fan will be working against a vacuum and can do nothing. Electrical: 110 V AC, 60 Hz. 3-wire grounded cord. A1212 Fan: This fan's housing measures 12" x 12" x 4". Airflow is from 400-800 CFM. Good for room up to 12 x 12 feet. One piece molded body and 5 section molded louver. Pro-Lab SL/PS: Comes with 6" Exhaust Pipe Starter. Used to exhaust air out of the darkroom using a 6" diameter galvanized pipe through the ceiling and roof to a roof rack. Airflow is from 600-900 CFM. It requires 18 x1 18" supply louver (L1818). Good for room size from 15 x 15' to 20 x 20'. Pro-Lab SL/WC: This is similar to SL/PS fan but suited for exhaust air out of the room through a thick cinderblock wall or stud partition dry wall. Comes with Outside Exhaust Wall Cap, which has an anti-back-up-flap against air coming in when the fan is off, and a grill to keep out small wild life. All units come with 3 feet three wire grounded power cord. Dimension B 13¾" 13¾" 13¾"
Dimension C 12" 12" 12"
Dimension D 12" 12" 12"
Dimension E 4¼" 13" 13"
Cut-out Size 12¼" x 12¼" 12¼" x 12¼" 12¼" x 12¼"
Different sizes of fresh air supply louvers are available. Dimension E 1 ¼" 1 5/8"
Cut-out Size 12¼" x 12¼" 23¾" x 12"
A Speed Control device saves energy by controlling the air flow from the top-rated CFM of the unit down to 20 CFM.